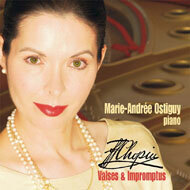 Marie-Andrée Ostiguy always wanted to make a recording of her favorite composer, Frédéric Chopin. For this 76 minute CD of romantic piano music, she chose some of his most beloved music, the popular VALSES & IMPROMPTUS. Sparkling and evocative, this collection of 17 waltzes and 4 impromptus includes the famous "Minute Waltz", the romantic "Les Adieux" as well as the magnificent "Fantaisie-Impromptu". Performed by Marie-Andrée Ostiguy on the Yamaha CFIIIS piano and realized by Henri Brassard, this album was recorded in Québec, at the Saint-Hilaire church, on May 24 and 25, 2001. VALSES & IMPROMPTUS is great for soothing your soul and is perfect for a romantic evening. Just add your favorite person, candlelight, a nice bottle of wine and voilà!